Towmaster’s app contains PDFs of all of Towmaster’s trailer models, an extensive image gallery, links to Towmaster’s website, YouTube videos and social media, plus you can send images and PDFs from directly within the app. 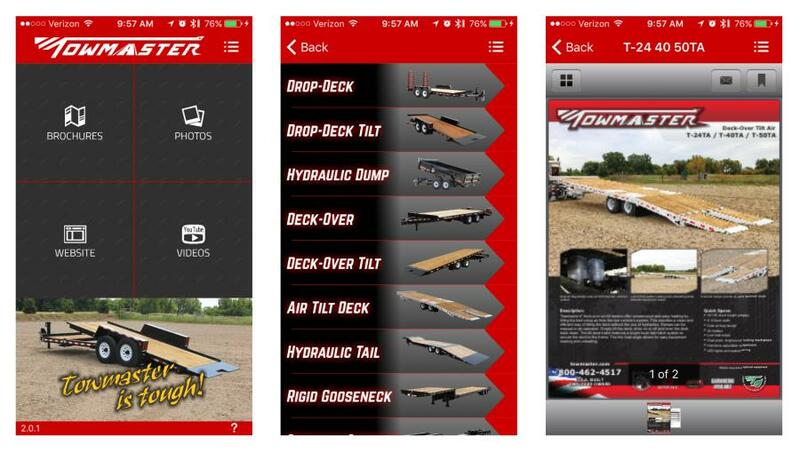 Towmaster Inc., manufacturer of equipment trailers and truck bodies, released a major update to its original iOS trailer app. This new version is faster, more intuitive and offers a new slider menu, according to the company. Towmaster's app contains PDFs of all of Towmaster's trailer models, an extensive image gallery, links to Towmaster's website, YouTube videos and social media, plus you can send images and PDFs from directly within the app. Need to contact a sales rep? Simply go to the contact screen and click the email or phone number. The update is available now on iOS devices with an Android update currently in development. If you have the original app installed, you can update it through your App Updates.